ItemBARK_1990.0003.0480 - Mr. Chew Lai Keen (left), Mrs.Lim Foon Hai Hoy holding a baby and Mrs. Lui Mun Ho Keen holding daughter Beatrice; circa 1920. 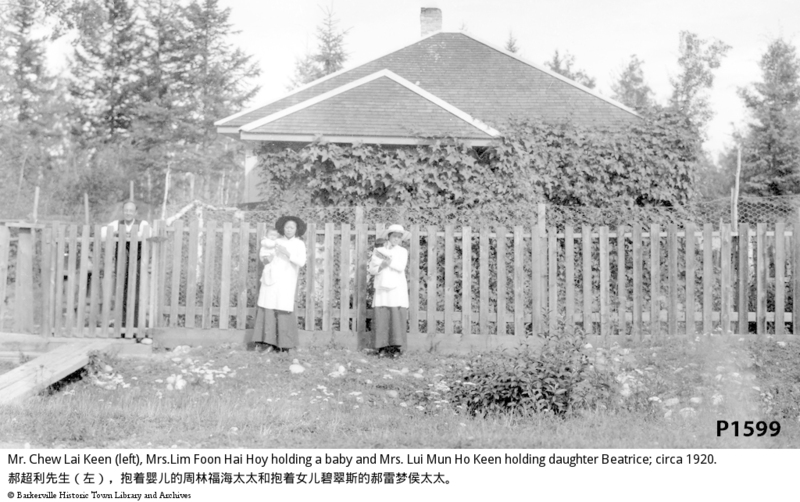 Item BARK_1990.0003.0480 - Mr. Chew Lai Keen (left), Mrs.Lim Foon Hai Hoy holding a baby and Mrs. Lui Mun Ho Keen holding daughter Beatrice; circa 1920. Mr. Chew Lai Keen (left), Mrs.Lim Foon Hai Hoy holding a baby and Mrs. Lui Mun Ho Keen holding daughter Beatrice; circa 1920. A group photo in front of a house. Mrs. C.D. Hoy is second from the right, holding a baby. Two women (Chinese) holding two babies on the outside of the fence. There is a man (Chinese) standing on the inside of the gate of this same fence.